Robin is an Environmental Manager for an Offshore Oil field. The field includes an Offshore Installation as well as numerous sub-sea tie backs. Robin studied a BSc in Environmental Technology at the University of Abertay, during which he undertook an industrial placement working as a Technical Officer at an incineration plant. Since leaving university he has held various environmental positions in both the public and private sector. He has been working in the Oil and Gas industry since 2007. Initially on completing university he began working with a Local Authority as a Technical Officer specifically dealing with noise measurement and Local Air Quality Management. He then moved onto environmental regulation with the Scottish Environment Protection Agency (SEPA), working with a variety of industries, such as fish farming, quarries and waste incineration to name but a few. 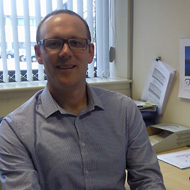 A desire to broaden his environmental knowledge prompted Robin to begin working as a Processing and Development Manager for Mainstream Scotland Ltd. He focused on the development of fish farming sites through Environmental Impact Assessments (EIAs) and tackling the energy and resource consumption challenges facing this business. Following this Robin worked with Johnson & Johnson on environmental management systems, and later leading a team producing EIAs on behalf of Transport Scotland. As an Environmental Manager in the Oil & Gas industry, Robin’s current function is to manage the day-to-day operational environmental performance, relative to regulatory permits and internal key performance indicators as well as developing environmental strategies relevant to future field developments. He is also responsible for the provision of all environmental processes and procedures, including oil spill response and air emissions monitoring, measurement and modeling. Working as an Environmental Manager in the Oil & Gas industry offers great variety, through interacting with numerous stakeholders and the learning that comes from such relationships. The learning curve in this field is steep, with the environmental challenges mirrored with operational challenges. This, along with the odd trip in a helicopter, adds to the interest provided by such work. A current project of interest for Robin is in major capital expenditure, which will ultimately provide self-sufficiency in power generation requirements for the -offshore installation. The important elements to this are twofold: to meet production and reserves targets, and also allow a better, more reliable and consist source of energy supply. This will allow optimum operational efficiencies across the board.